The thing I love about the Isle of Wight (apart from its lush nature and fabulous sea views) is how it never ceases to surprise me. Take this! We had been to Newport – the island’s principal town – numerous times. We had explored its surroundings in detail. Yet, it was only during our last visit to the island that I came to know that right here, in the heart of it all, stands a castle, which, OK, I will admit it, I had never heard of before. And it is not some small fortification or a negligible keep. No, nothing of the kind. Instead, it is rather huge. Have a look for yourself. This is a big, strong castle with thick defensive walls. Walk through the massive entrance gate and you will discover the tragic history of a captive king and his unfortunate daughter. Plus, there (allegedly) are several ghosts haunting the castle’s garden and rooms. Throw in a donkey well, too, and you have a good idea how totally fascinated I was with Carisbrooke Castle and how much I enjoyed our visit to it. Let me start at the beginning! 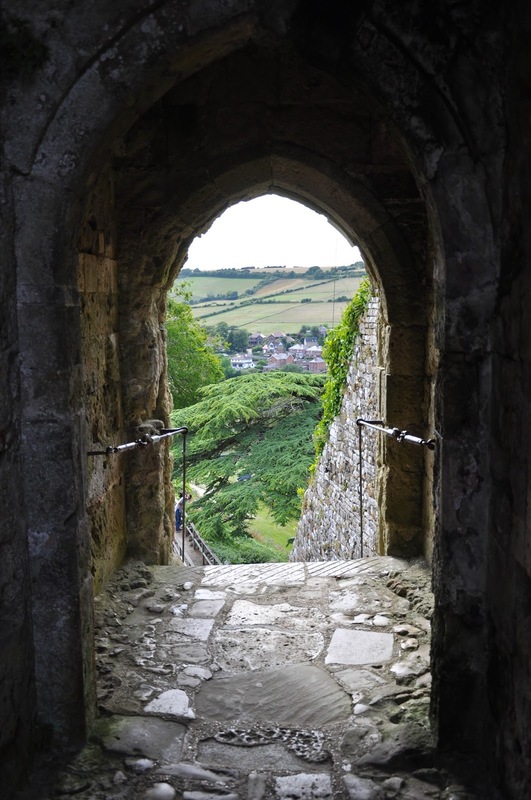 Carisbrooke Castle stands on a hill in the village of Carisbrooke near Newport on the Isle of Wight. 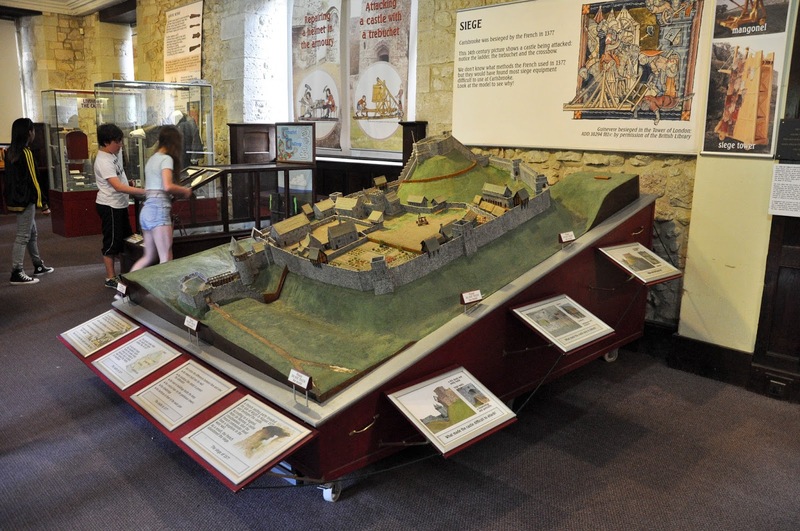 Roman and Anglo-Saxon strongholds had occupied the site for centuries and a strong wall, built around the year 1000, was used to stop Viking raids. From then onwards the castle was expanded, fortified and improved several times. 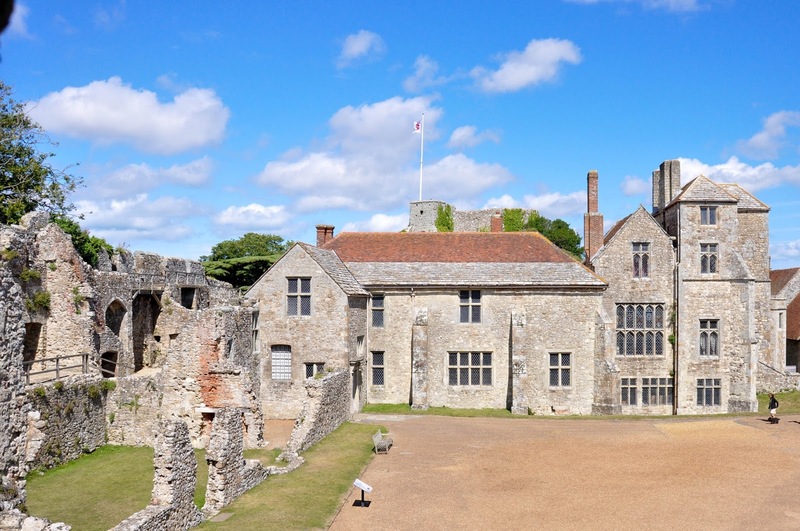 Carisbrooke Castle is, perhaps, most famous for the fact that Charles I was held a prisoner within its walls for a year and two months. He was the king whom Oliver Cromwell removed from the throne in order to establish the first (and so far the only) Republic on the British Isles. The republic became known as the ‘Commonwealth of England’ and it survived for all of 11 years before the monarchy was restored. We reached the mighty defensive walls of Carisbrooke Castle on a hot and sunny summer afternoon. 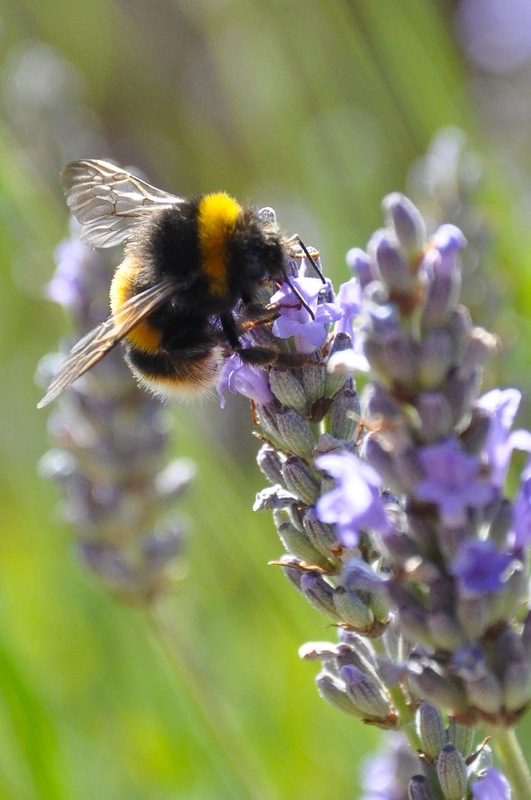 It was all so peaceful and quiet you could hear the buzzing of the bees among the lavender sprigs in the patch at the entrance. Ticket in hand, we walked through the main entrance and stopped for a second to admire the sprawling courtyard surrounded by ruined walls and preserved buildings. Then we scaled the steep flights of steps and walked along the ramparts. 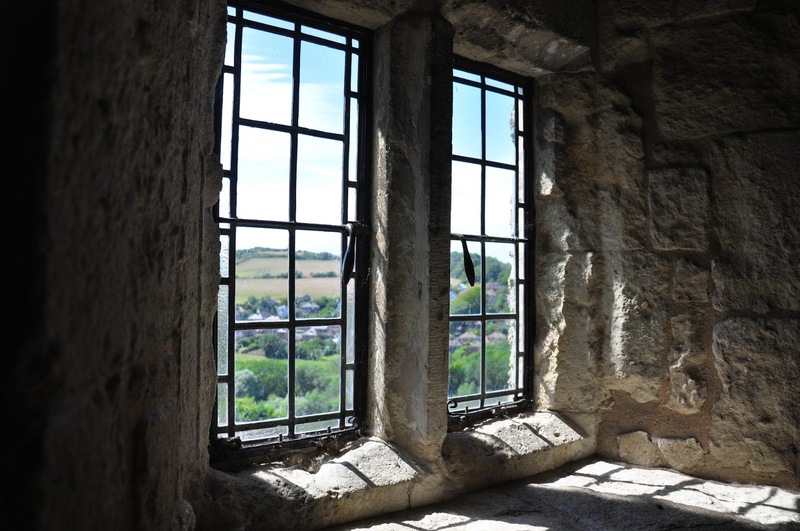 It was really nice to slowly take it all in – the beautiful view across the hills and the fields which surround Carrisbrooke Castle, the small dark rooms you can reach by spiral staircases inserted in ancient turrets and the mighty walls the crenelated tops of which had started to succumb to the passage of time. Just then we noticed a thick queue starting to form by one of the smaller buildings in the courtyard. It was close to three o’clock and, based on the information we were given when purchasing our entrance tickets for the castle, any minute now there would be a demonstration of how water used to be extracted from the castle well using donkey power before water supply was centralised. We quickly joined the queue. In all honesty, being Bulgarian and after living in Italy for a year now, it felt good to be in a queue where each person not only knew the unspoken rules of queuing, but was only too happy to abide by them, too. British people are simply the best at queuing – polite, respectful and always eager to make sure that they are not inadvertently jumping ahead of you. There is no need for ticket machines in order to regulate the queue and avoid disputes over who was first, as it is the case in Italy. We were just discussing the cultural phenomenon of queuing when two ladies from the castle’s staff came into view. They were leading a small cute donkey. The ladies unlocked the heavy door to the room where the well was and ushered us all in. The room was small and dark and, this being Britain and people cherishing their personal space, it proved quite a task to fit us all in. Initially, everyone kept a little bubble of sacred distance between themselves and the strangers around. The two ladies kept cajoling us to move further into the room and to squeeze more tightly together, so that no-one who had been queuing would be left disappointed outside. In the end, we were all compactly pressed in, not unlike sardines in a smallish tin, but this only served to activate the British sense of camaraderie which surfaces when everyone has found themselves in the same imperfect circumstances. Pressed against the wall, I lifted the camera above my head, eager to capture the action without heads, hats and hands photobombing the final photos. In the centre of the dimly lit room rose the mighty body of the well. Right by it stood a huge treadwheel. The little donkey didn’t need cajoling and expertly stepped in it. We were given an engaging talk about water and its supply to the castle. It was fascinating, really! 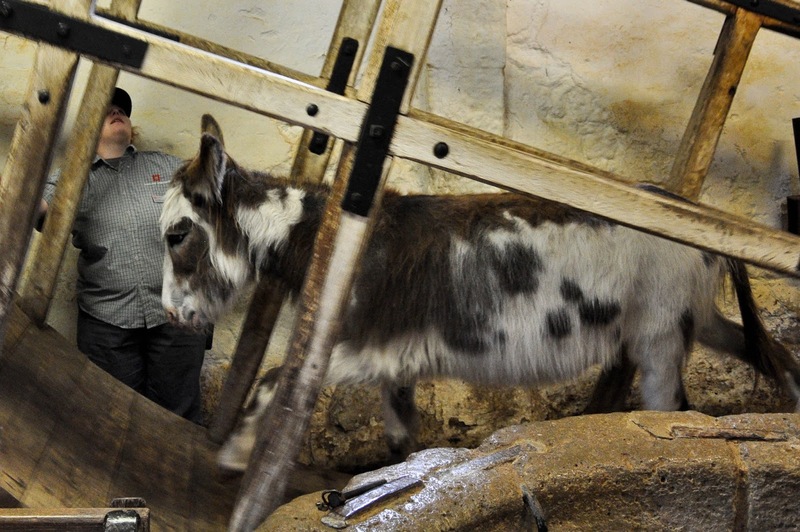 You come to realise how difficult it was for people to perform even the most mundane daily tasks, like washing oneself and one’s clothes, when water was coming out in buckets raised from the depths of the Isle of Wight thanks to the back-breaking monotonous work of donkeys. We were told that the water was lifted up from a depth of 49 meters. It didn’t sound that much until the lady leading the demonstration dropped a little pebble in the well. It took a few seconds before we all heard it hitting the bottom and everyone who was tightly wrapped around the body of the well instinctively tried to step back. The well and the donkeys were used from the 16th to the beginning of the 20th centuries, when water started being piped to the castle. 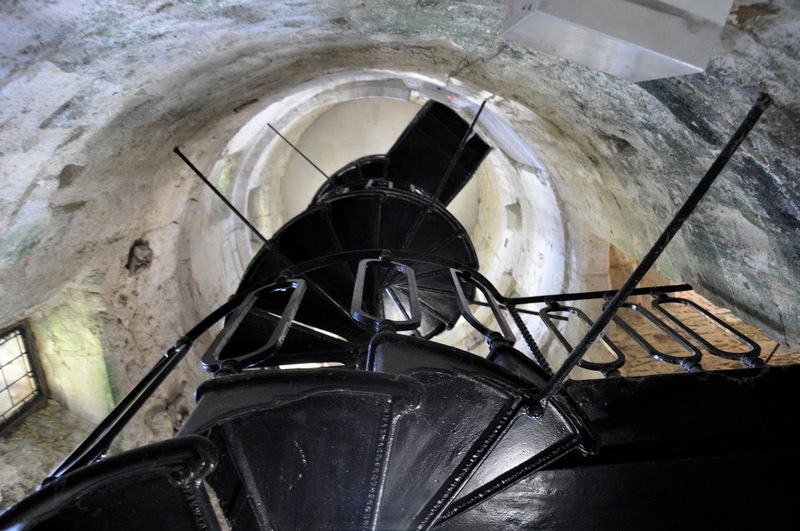 The treadwheel has been attracting curious visitors to the Isle of Wight since the middle of the 19th century up to the present day. Donkeys still live on the castle grounds, but have it much, much easier than their earlier counterparts. For example, they don’t work more than 6-7 minutes altogether a day and enjoy days off, which was unheard of before. The well nowadays is used mainly for measuring the water table of the island and only one bucket of water is lifted from it during each demonstration, so that the donkeys don’t have it too hard. 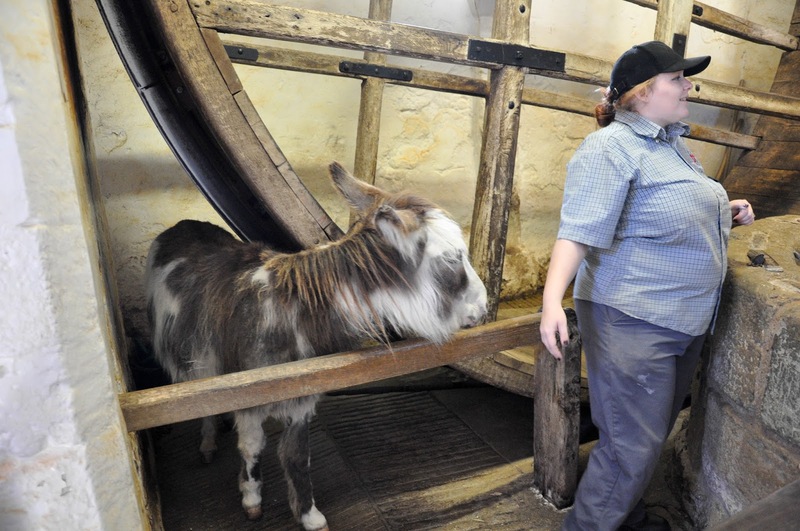 Just then the little donkey started walking in the treadwheel. 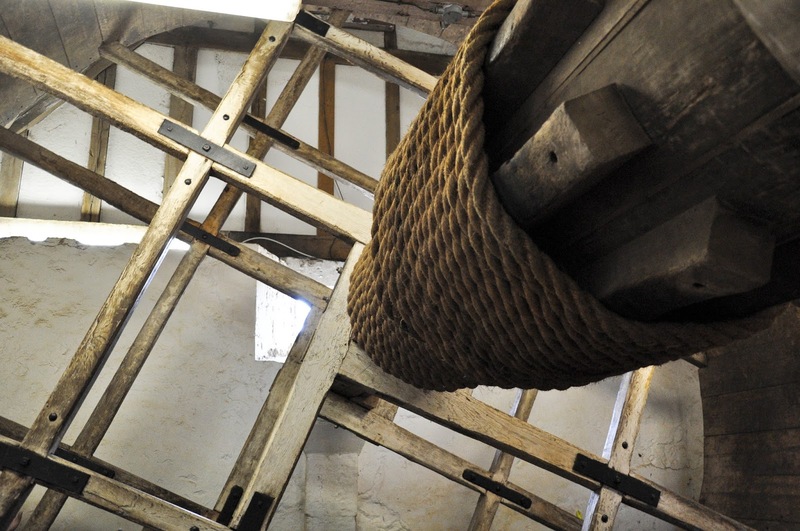 The big wooden structure started turning and very, very slowly the rope began to coil around the pulley. After a few tense seconds, a bucket full of water appeared in the dark opening of the well. 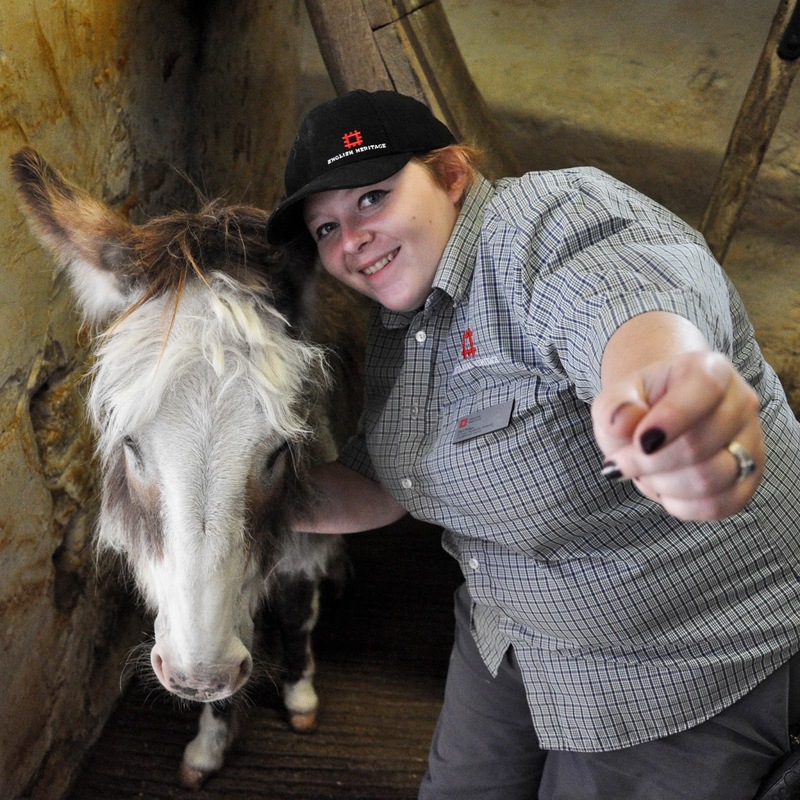 We all burst into applause for the donkey, who took her cue and stopped work. Then she posed for pictures and looked like the most docile and sweet thing on Earth, irrespective of the warning sign on the wall. Once the demonstration finished, we explored the castle further. A door led us into the Museum which was founded by Princess Beatrice – daughter of Queen Victoria and Prince Albert who used to spend long stretches of time on the Isle of Wight. There were lots of things to see and admire there. The exhibition dedicated to the Prisoner King grabbed my attention. 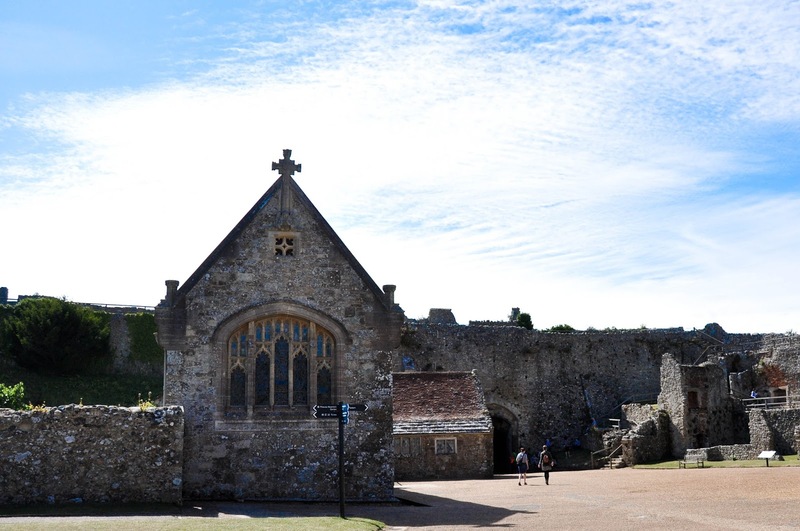 Charles I spent 14 months at Carisbrooke Castle before his execution in 1648. 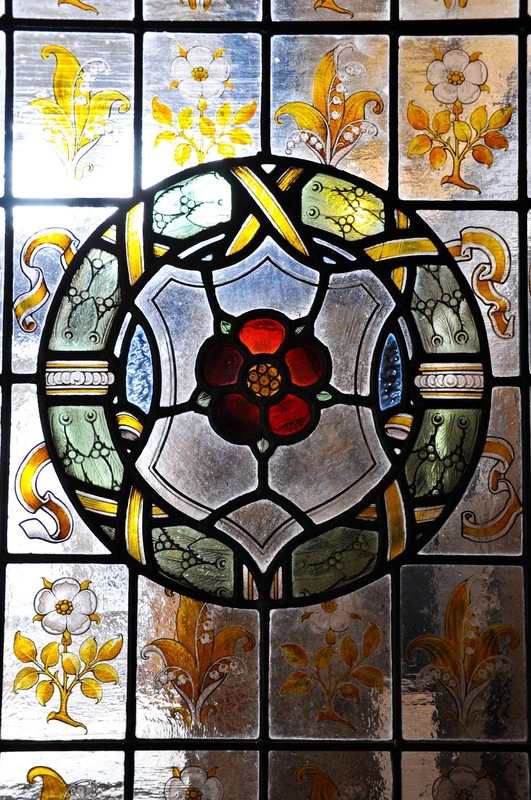 This amazing stained glass panel adorns one of the walls of his bedroom. Initially, he was treated as a guest, but after rejecting the Parliament’s efforts to achieve an agreement with him, he became a prisoner. He still ate 20-course dinners and had servants to wait on him. He even planned his escape, but couldn’t get through a small window and had to face his fate. Nowadays, his bedroom forms part of the Museum. I was particularly taken with one small exhibit. 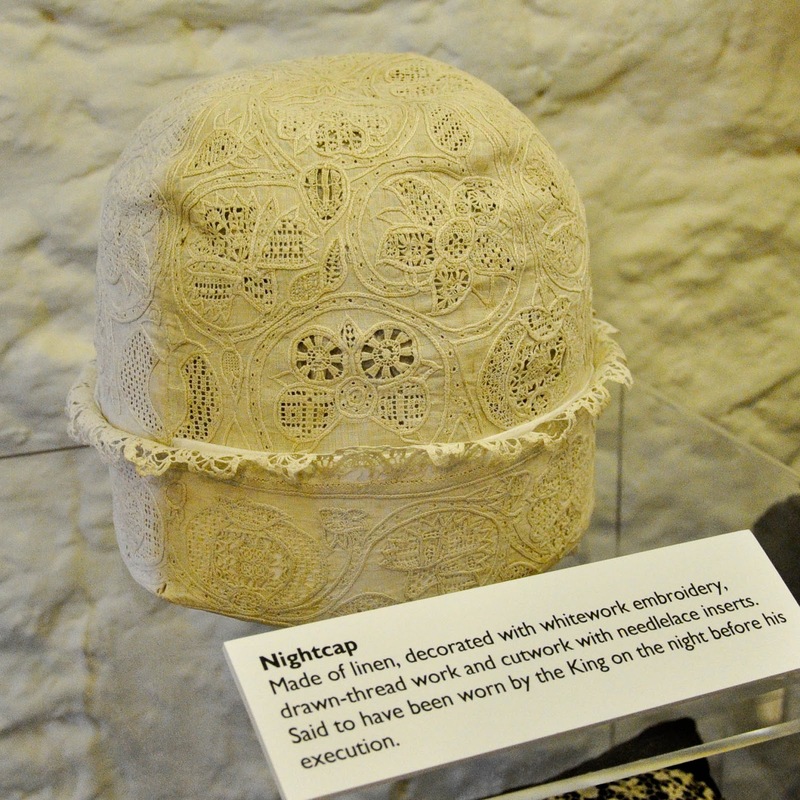 This nightcap, lavishly decorated with whitework embroidery all done by hand, is said to have been worn by the King on the night of his execution. I am forever fascinated by objects which have borne witness to historical events affecting human lives and yet have survived through the centuries giving us a direct glimpse into history. 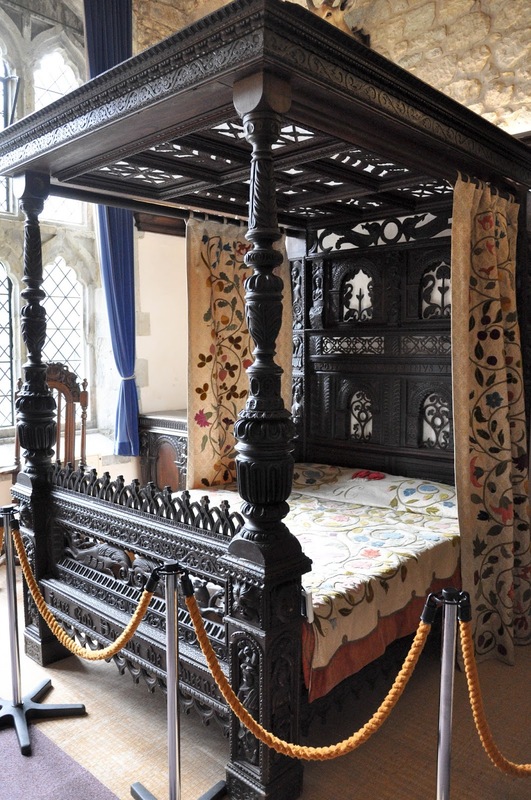 Unlike the original nightcap, the lavish Elizabethan bed in the King’s bedroom is a reproduction and had been installed there to give the visitor a sense of the style of furniture used by Charles I during his time at the castle. 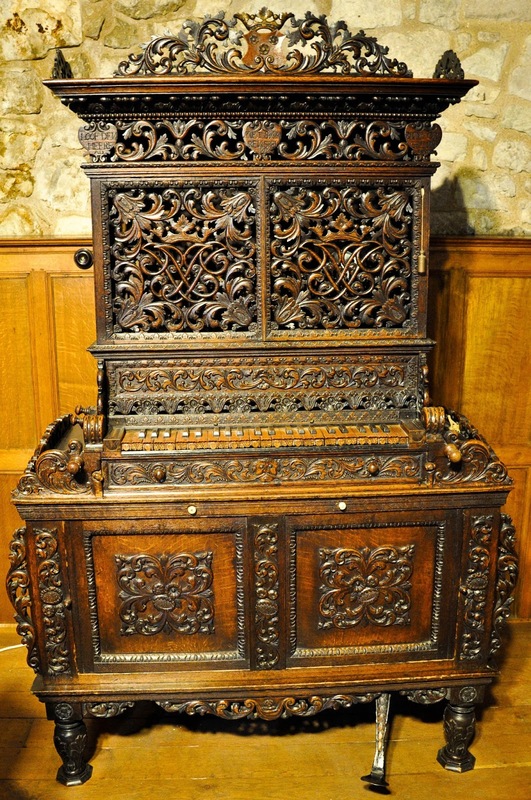 The museum has several other highlights, like this chamber organ. Built in 1602, it is one of the oldest in Britain still in working order. 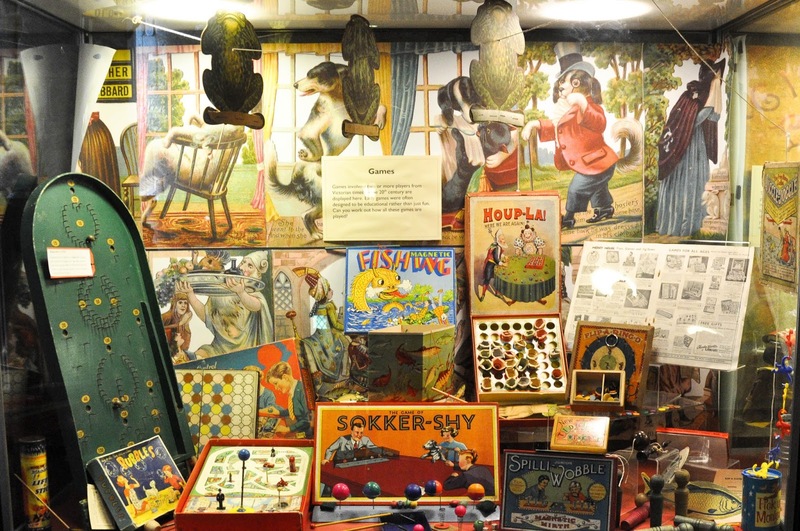 There is also a Turner painting, a silver mace dating back to the 15th century and a fabulous collection of antique and vintage children’s toys, dolls and board games. Once back outside, we walked around the castle’s inner yards and found ourselves by the stables where the donkeys were being taken care of. The lively lady, who had led the water well demonstration, was there, too. We had a little chat and she gave us all the inner scoops on life in the castle now and then. What I found extremely curious was that, apparently, you can rent an apartment in the castle to spend a relaxing week at. 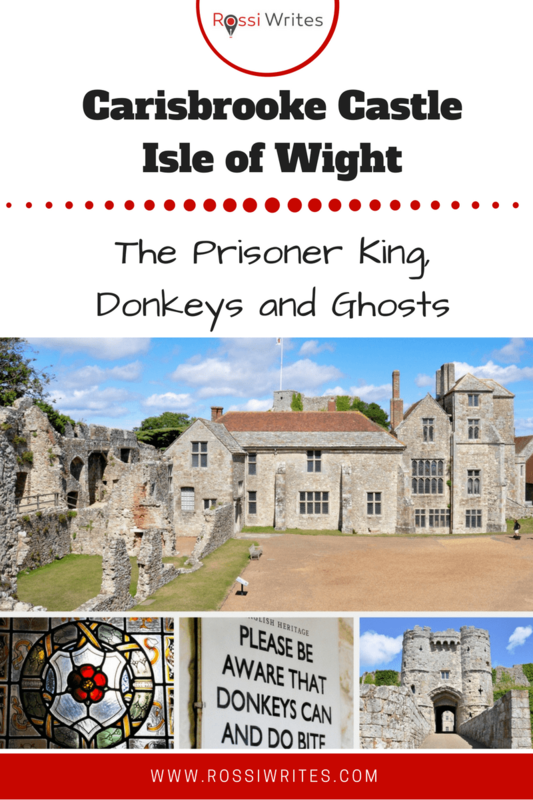 We were told that once the castle shuts its doors at the end of the working day, no-one stays in overnight and even the donkeys retreat to a nearby field. As such, the people renting the apartment have all of the castle grounds to themselves. You can go for a walk on the defensive walls, explore hidden corners and generally feel like a queen or, respectively, a king for the duration of your stay. Then the talk turned to ghosts, after I had had the bright idea to ask if the castle was haunted. You know what?! Parts of it are! People have reported hearing children playing in the garden, when there was no-one (visible to us) there and also, it seems, there is a sad and overwhelmingly dark presence felt in the room where the tragic daughter of Charles I – Princess Elizabeth – died at 14 years of age. 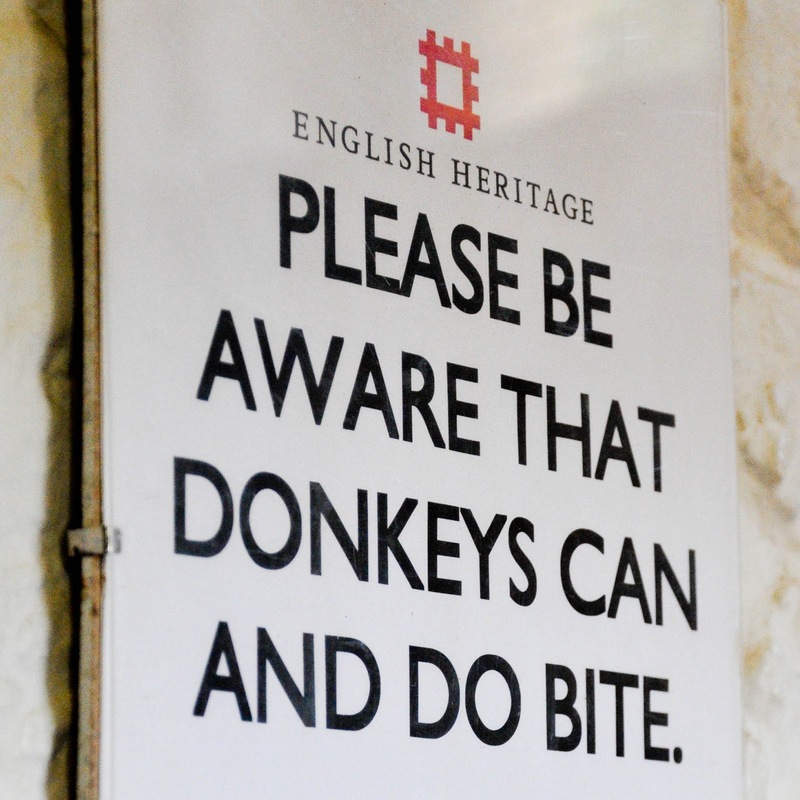 Eager to take our minds off it, we patted the donkeys one last time and continued our walk around the castle. A steep and tall flight of irregular stone steps took us all the way to the top of the ancient Norman castle keep dating back to 1100. 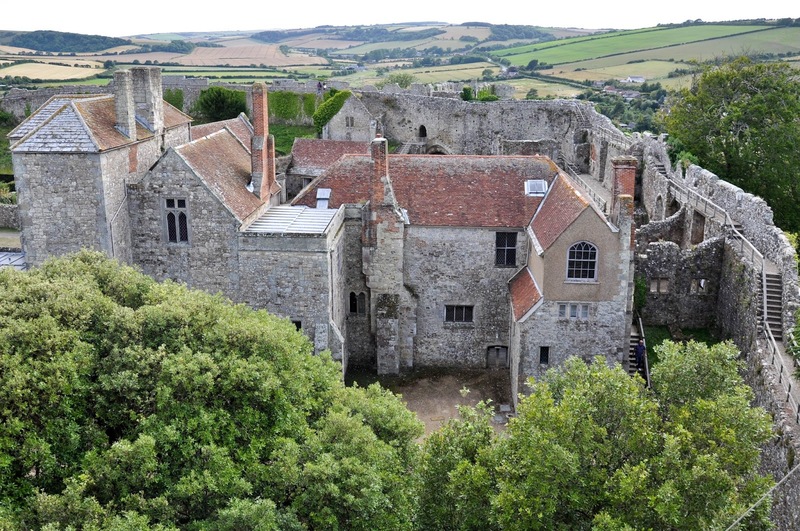 There we had a quiet moment, just drinking in the beautiful views and thinking about the centuries of history which had left their mark on Carisbrooke Castle and the people for whom it had been home. 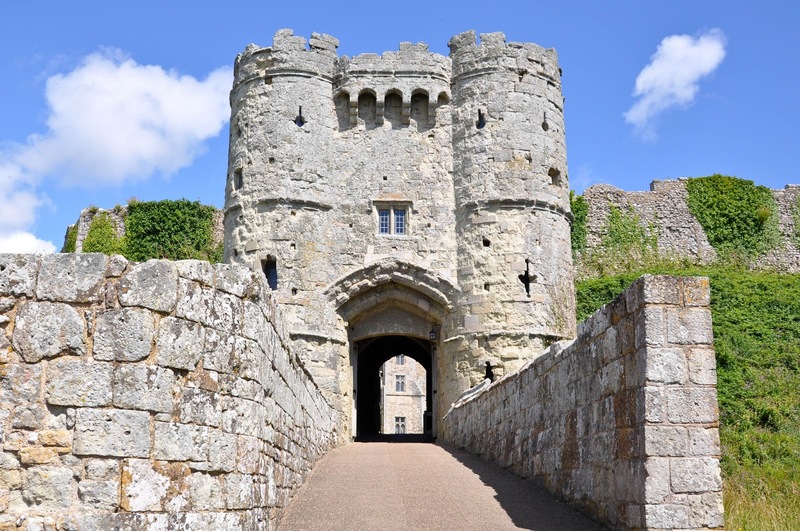 Have you been to Carisbrooke Castle before? Let me know what you thought and what was your favourite thing about it.